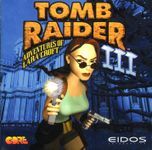 Tomb Raider III: Adventures of Lara Croft is a platform and third-person shooter game developed by Core Design and published by Eidos Interactive. It is the third instalment in the Tomb Raider series, and the sequel to Tomb Raider II. The game was originally released for PC and PlayStation in November 1998 and for the PlayStation Network in 2009. The story follows Lara Croft as she embarks upon a quest to recover 4 meteorite stones scattered across the world. Source: Wikipedia, Tomb Raider III , available under the CC-BY-SA License.